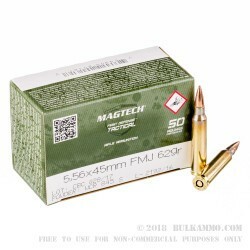 This 5.56x45mm ammo is imported by Magtech from Brazil. 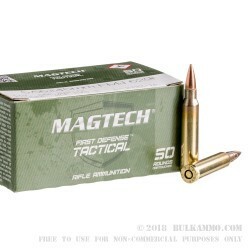 Magtech has earned a strong reputation for high quality range ammo in the US and abroad supplying many police departments and military forces around the world. 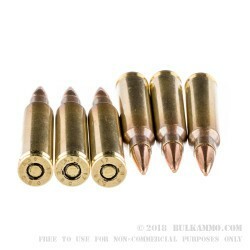 This reloadable brass-cased ammo is topped with a 62 grain lead core full metal jacket projectile making it great ball ammo for range training. Decided the sale price was too good to pass up, and I am VERY pleased with this ammo. The rounds came in a Magtech over-box (being a subsidiary of CBC), but the contents are as pictured above. Put the first 300 rounds through a SIg 516 with zero issues. Did not expect match-grade of course, but that's not what I bought it for. Consistent groups at 100 yards and clanging the 8" gong at 300 yards all day long. It is going to make for a great range day ammo. I have made several prior purchases of PMC - 62gr FMJ for the same price considerations, but I think CBC is the better performing ammo of the two. 5 Star Performance Rating taking into account the price vs quality ratio. 4 Star Bargain rating because let's face it, all ammo is overpriced. Q: How is the ammunition packaged? Are there expiration dates on this ammunition? A: This ammunition is packages in 50 round boxes, and there are 20 boxes per case. No, there are not expiration dates on ammunition. The shelf life of ammunition is determined by how well it is stored. You want to keep it in a cool, dry place, with little to no moisture. Q: What is the muzzle velocity of these rounds? A: Hello Steve, The Muzzle velocity of this round is 2992 fps as noted by the manufacturer. Q: Is this ammo all new or reloaded ? A: Hello Steve! This CBC ammunition is new manufacture. CBC is the parent company of Magtech and this ammunition is made in their state of the art plant in Brazil. A: Hello Rene! This ammunition is loaded with all non-corrosive components! Q: I live in Hawaii and can't be shipped here so I need to have someone send it to me. How much does 1000 rounds of 5.56 weigh? A: Hello Elizabeth! The shipping weight for 1000 rounds of this ammunition would be just under 30 lbs. A: Hello Teddrod, Thank you for reaching out to us about the CBC ammunition. The CBC ammunition is loaded with a reloadable brass case. Q: Does "Non-Magentic" mean that these rounds lack a steel penetrator? A: Hello Daniel, You are correct. This 62 grain ammunition is a standard copper coated, lead core bullet that does not feature a steel penetrator.